Edmund Gustav Albrecht Husserl (IPA: [ˈhʊsɛrl]; April 8, 1859, Prostějov, Moravia, Austrian Empire – April 26, 1938, Freiburg, Germany) was a Austrian-German philosopher and mathematician who is deemed the founder of phenomenology. He broke with the positivist orientation of the science and philosophy of his time, believing that experience is the source of all knowledge. 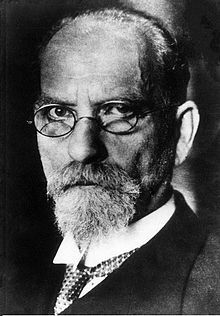 Husserl was born into a Jewish family in a town that was then in the Austrian Empire (after 1918 a part of Czechoslovakia, and since 1993 a part of the Czech Republic). He became a member of the Lutheran Church in 1886. Edmund Husserl (1859-1938). -- Marianne Sawicki. Accessed 2008-11-18.
www.husserlpage.com. Includes a number of online texts in German and English. "Logic and Formal Ontology in the Work of Edmund Husserl." Resource guide on Husserl's logic and formal ontology, with annotated bibliography. Spanish website on Husserl and phenomenology. Website devoted to Husserl's phenomenology and its relation to art and architecture, with specific reference to architectural drawings. This page was last changed on 31 October 2017, at 17:36.